The Bear Flag Revolt was a popular uprising of settlers in Sonoma, California, against the Mexican government, which at that time controlled California. The revolt began on June 14, 1846. The uprising was short-lived. The participants never formed a government, although they did design a flag: the Bear Flag, which became the model for the California state flag in subsequent years. The original bear flag – pictured on this page – was designed by William Todd, a nephew of Abraham Lincoln. The flag was destroyed in the San Francisco earthquake and fire in 1906. The Republic’s first and only president, William B. Ide, ceded control to the United States Army when Major John Fremont arrived with approximately 60 troops. The Republic had lasted just 26 days. California was formally annexed as a territory of the United States by the Treaty of Guadalupe Hidalgo, in February, 1848, and became a state in 1850. 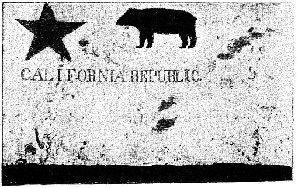 The original California Bear Flag was designed by William Todd in 1848. This photo was taken in 1890.